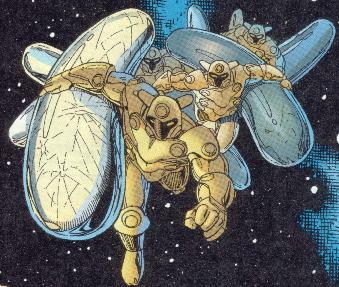 The Infinites were originally a group of three "abstract beings" of incalculable power. While manifesting in our dimension, one of their hands was as big as Eternity himself. They continued to dwarf him in the Dimension of Manifestations. The Infinites sought to align the energies of all the universes known to them in a manner they considered harmonious. This involved turning planetary mass into raw materials, fashioning it into a ring, and yanking it in a manner that would pull the stars along. Oh yeah, and killing billions upon billions of beings in the process. (Avengers Infinity#1-4) The Servitors killed everyone on the Rigellian outpost R-76 as part of the preparation for The Infinites' realignment. Quasar discovered the slaughter and sent a call to Avengers Mansion. The regular team was out on another mission, but Thor (who had temporarily stepped down) got the call and went to help his Rigellian friends, meeting up with Photon and Moondragon along the way. Starfox and Tigra also received the message and they all met up with Quasar on R-76. 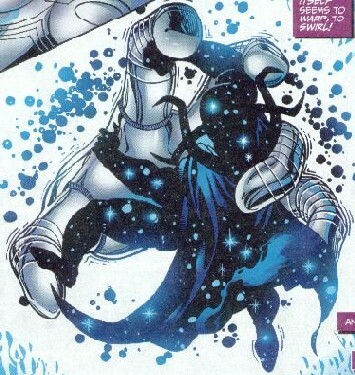 Quasar had also found Jack of Hearts who was injured trying to fight the Servitors. The Servitors attacked anew and the Avengers managed to defeat them. However, Photon discovered that there were millions more Servitors underground and that the planet was doomed. The team fled, much to Thor's chagrin. The Avengers could only watch helplessly as the planet exploded. Things went from Bad to Worse when a massive, armored, humanoid figure emerged from a space warp. The heroes all ASSumed that this figure was an Infinite, and resolved to fight it, with Thor and Quasar giving pep talks about how they had beaten other Big Cosmic Threats. Meanwhile, the figure was manipulating the molten mess that had been R-76 into a curved, metallic shape. The team decided to scout out the threat to figure out exactly what they were up against. Photon phased into the "Infinite" while mentally linked with Jack and Moondragon. However, they lost contact with her and the heroes rushed to her aid while Tigra stayed with the ship. Tigra reported that other "Infinites" were coming in with curved shapes and were linking them together with their bodies. The heroes fled from the creature's body just as the full horror dawned on Jack. The beings they were seeing were merely "The Walkers" a tool for the true Infinites! An enormous hand appeared out of nowhere, preparing to grasp the handle formed by the Walkers. Jack told the assembled Avengers that when the Infinite grasped the ring, an energy wave would shoot out, linking all the stars in the Milky Way, which would then be added to the Infinites' "Wall of Galaxies", destroying all life in the process. The heroes linked their wills with Quasar's who then summoned Eternity. Eternity began to grapple with the Infinite's hand, which was as large as Eternity himself. Then, Eternity and the Avengers were shunted into the Dimension of Manifestations, where cosmic beings can interact more easily. One by one, the Avengers spoke through Eternity and convinced the Infinites that the lives in the galaxy were worth saving. After rebuking Thor for his arrogance, the Infinites dissolved the ring, and one of them gave its life to reform R-76 and turn it into a virtual paradise. He bid the Avengers farewell as its essence merged with the planet's. What became of the other two Infinites is unknown. COMMENTS: Created/mentioned by Kurt Busiek. Detailed and pictured by Roger Stern and Sean Chen. Hmm. . .a trio of omnipotent beings, one of whom gives its life to save a doomed planet. . . .Seems I've heard that somewhere before . . . This story was beautifully drawn by Sean Chen, and there were some great character moments between the Avengers with lots of continuity thrown in. However, I thought the Infinites were kinda lame. Cosmic entities who can dwarf Eternity need a handle to control galaxies? And they can't even restore life on one lousy planet without sacrificing their own? Whatever. Still, an enjoyable LS for the characters and art. The explanation of the "Megaverse" and Omniverse can be found here. This profile represents Chuck's last for the foreseeable future. Life, his career, and his impending marriage are going to have to take priority. Best wishes Chuck! We'll miss you. And yes, I did say marriage. Have faith, young (and old) comic readers, some day it is possible that you, too, may someday move out of your parents' basement, and maybe even kiss a girl ( a real girl!) ! I'm living proof. Just celebrated my 10th anniversary in 2007! other "Infinite" characters, groups, etc. The Servitors were humanoid automatons approximately 9' feet in height created from the bodies of the Walkers. Their primary function was to tunnel through the layers of a planet and expose the core. This would destroy the planet and render it into raw materials which the Walkers could manipulate. They were also programmed to defeat any opposition to the Infinites' plan. They possessed superhuman strength sufficient to knock Thor off his feet. They could also fire an energy beam from their "face" which could shatter Quasar's energy constructs and give him a major concussion. If a Servitor was shattered, each piece would merge with surrounding materials and form a new Servitor. The Walkers were planet-sized, humanoid automatons who were responsible for forming the handle the Infinites used to carry away galaxies. They would do this by molding a destroyed planet into a curved shape, and linking it with similar shapes formed by other Walkers. They were never seen in battle, but their armor could be pierced by one of Quasar's quantum drills. They defended themselves from internal attacks by creating Servitors.